Made with tender pieces with Ocean Fish. 100% complete and balanced nutritional pet food for adult cats (aged 1 to 7). Cooked with care for preservation of taste. Served in 85g can to keep every meal fresh and convenient. Packed with essential vitamins and minerals to keep your adult cat healthy. No added artificial colourants, flavourings, preservatives. 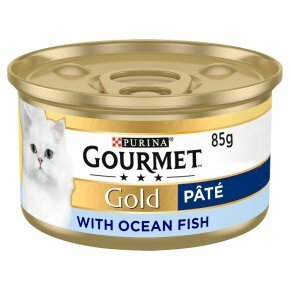 GOURMET Gold has created Paté, a delicious wet cat food recipe to spoil her sophisticated palate with a unique taste experience. Tender paté with ocean fish carefully prepared to offer your cat the pleasure of a delicate and smooth sensation. Patés from GOURMET Gold, tempt your cat with a soft, velvety delight! For an average adult cat (4kg), feed 3 cans per day in at least 2 separate meals. The adult maintenance averages are based on moderately active cats at normal environmental temperatures. Individual needs vary and feeding should be adjusted as required to maintain your cat at a lean, healthy body weight. For pregnant or nursing cats; feed as much as your cat will eat. Serve at room temperature. Clean, fresh drinking water should always be available.